"Microsoft's future path is riding on Windows 8 and its success," said Gartner Inc. analyst David Cearley. "This is a chance for Microsoft to re-establish itself in a market where it's becoming increasingly irrelevant. 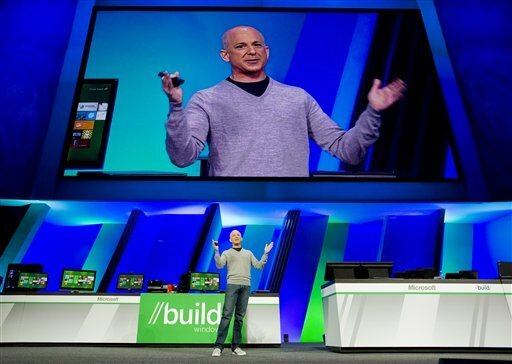 "View full sizeAssociated Press fileSteven Sinofsky, president of Windows and Windows Live, gives the keynote address and a preview of Windows 8 at the Microsoft Build Windows conference at the Anaheim Convention Center in Anaheim, Calif.
SAN FRANCISCO -- Microsoft is scrambling to preserve what's left of its kingdom. The stakes are much different as Microsoft Corp. puts the finishing touches on Windows 8 -- perhaps the most important piece of software the Redmond, Wash., company has designed since co-founder Bill Gates won the contract to build the first operating system for IBM Corp.'s personal computer in the early 1980s. A test, or "beta", version of the revamped operating system will be unveiled Wednesday in Barcelona, nudging Windows 8 a step closer to its anticipated mass market release in September or October. The company will offer the most extensive look at Windows 8's progress since it released an early version of the system to developers five months ago. Microsoft designed Windows 8 to help it perform a difficult balancing act. The company hopes to keep milking revenue from a PC market that appears to be past its prime, while trying to gain a stronger foothold in the more fertile field of mobile devices. It's a booming market that, so far, has been defined and dominated by Apple Inc.'s trend-setting iPhone and iPad and Google Inc.'s ubiquitous Android software.